One of the mistakes I see many of my less technical blogging clients and friends making is forgetting to maintain and keep their blog updated. I logged into a client’s site the other day to look at an issue they were having, and noticed they were down by 3 WordPress revisions, and about 15 plugins had updates pending! Needless to say, I coached them on the importance of updates and even offered to do them ongoing for them under a maintenance agreement. One of the most important aspects of running a successful WordPress based blog is maintaining it. Maintenance involves a number of activities that have to be done on a routine basis to keep your blog updated, running as fast as possible, and secure. Many bloggers make the mistake of thinking that the majority of updates for WordPress, Themes, and plugins are optional and only provide new features. While this can be true, many updates, especially for WordPress and Themes are intended to address known security issues. By choosing to not update your site, you are leaving it site open to a security vulnerability that can cause your site to be hacked or brought down all together. Pay attention to your WordPress dashboard, it will warn you if you are behind on WordPress or plugin updates. I highly recommend applying all updates immediately to avoid any risk. One of the problems I have, since I run about 10 different niche sites and blogs is keeping them all updated and knowing when they are out of date. I use WordFence security on all of my sites. Not only does WordFence scan your site daily for hacks or code manipulation, it will send you an email alert when you are “down level” on WordPress or any plugins. This keeps you from having to check your sites frequently and also ads the benefit of scanning. I am constantly amazed at the number of bloggers running WordPress based blogs that don’t have backups. I was engaged by a new client a few weeks ago, and they’ve been blogging for more than 3 years and didn’t have a single backup outside of their hosts weekly file backup! Needless to say, they do now. Can you imagine losing 3 years worth of posts? I’d flip if I lost a months worth, let alone 3 years! There are a number of backup solutions available to backup your WordPress blog, but I prefer paid plugin called BackupBuddy. You can read more about why I choose to use a BackupBuddy for my backups and more about how awesome BackupBuddy is in my article: How to backup your blog automatically. Regardless of which backup solution you decide to use, you should be backing up your entire blog (including files and database) weekly. If you write at least two times a week on your blog, you should also run a daily database backup as well. Backups are one of those things that you will seldom if ever need, not seldom think about, but when you do suddenly need one, having them makes all the time and money 150% worth it. Just this year, I accidentally deleted some theme files and caused this blog to be down. The timing was terrible as I had been linked that morning by another large blog. Thanks to having a backup solution in place, I was up up and running again in less than 15 minutes. Update: E. Dieter Martin made a great point on Google+ that I wanted to add to the article here. Not only should you backup your blog, but you should practice a few restores as well. Trying to figure out how to do a restore when your site is down is not when you want to learn. If you’re using BackupBuddy, I wrote a complete guide on how to do BackupBuddy restores. Having your site set-up in Google Webmaster Tools can really help you watch for significant issues with your blog and also for not found or pages with errors. I just finished up some work for a client who had more than 30 different not found (404) errors. We also determined she had a few “not able to follow” errors as well. Turns out those “not able to follow” issues were actually hacks! I have all of my sites set-up in Webmaster tools and have email notifications turned on, so that I know right away when there is a significant problem. I make it a habit to check for invalid links weekly, and resolve them. I’ve found that fixing a few links here and there weekly is far less time consuming than fixing 30 at one time. If you need to remove a page or post from your blog, don’t just delete it – there is a proper way to delete to avoid any issues. Make sure you register your site with webmaster tools, verify your site, submit your site map, and check your status every few days to look for any issues. Not only will this help make for a better website, it will also help your SEO and get you more search engine traffic. As for broken links (hey, they happen to us all), there are a number of plugins that help, but the one I prefer to use is: Broken Link Checker. Broken Link Checker monitors your blog for any broken links an notifies you when it finds them. This is more of a proactive way of avoiding broken links, where Webmaster tools is more reactive. I do know the broken links can impact your SERP results with Google, so better to avoid them all together if you can. 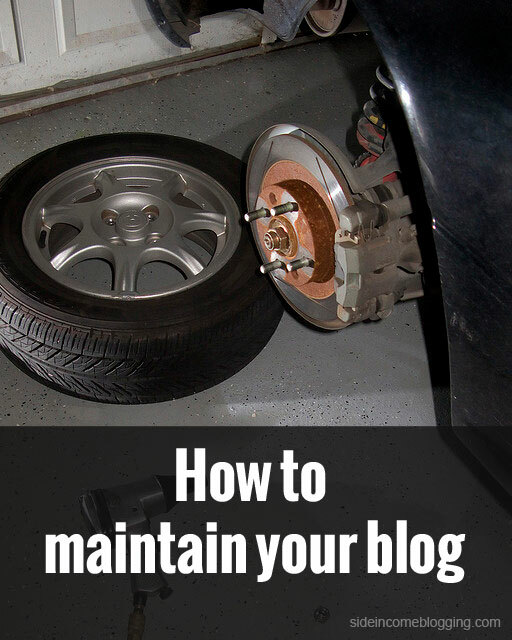 What other maintenance steps do you take on your blog? Am I missing something? Add your thoughts below in a comment! Excellent list of things you can do to prevent nightmares. This list is also filled with tasks that could be put into a procedure and delegated to someone else.